The inaugural GRCC Raider Invitational commences with a bang. 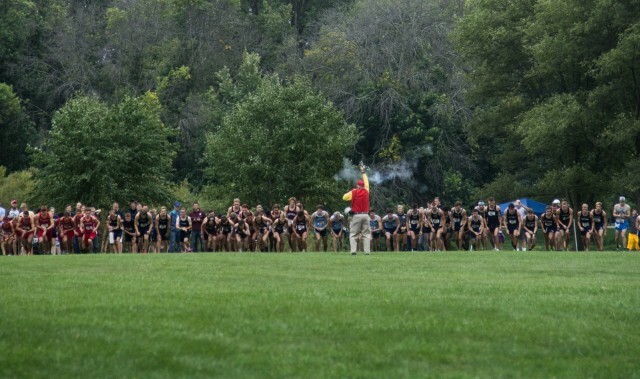 The Grand Rapids Community College men’s cross country team and two runners from the women’s team, Freshmen Jacqueline Jernigan and Jessica Quist, raced in the NJCAA Div. II National Championship Saturday, Nov. 12. Jernigan finished in 98th place of 313 finishers with a time of 20:21 in the 5K race. Quist finished behind her in 146th place with a time of 20:57. Both runners “left slightly disappointed with their results, yet were extremely happy with the season as a whole,” Head Coach Matt Sicilia said in an email about the results. The men’s team went into the race with the “dream big” season goal of finishing top 10 in the national championship. They fell short of that goal, finishing 16th of of the 40 Div. I and II teams competing in the race. Runners finished in this order: Sophomore Kirk Dickson finished 52nd with a personal best time of 26:44, who was 20 seconds short of All-American honors. Freshmen Chris Santana was next across the finish line in 72nd with a time of 27:10, followed by Bruce Buurstra in 122nd with a time of 27:50. Sophomore Brett Slayton finished 132nd with a time of 27:58, Freshman Nathanael Edwards came in 137th with a time of 28:03 and Sophomores Ryan Marshall and Isaiah Fox completed the race for GRCC with Marshall finishing 139th and a time of 28:04 Fox in 192nd with a time of 28:44. Sicilia was proud of the effort by both the men and women who raced, even though they may have not achieved exactly what they hoped for. This is the first time GRCC Cross Country has made it to the national tournament since it began offering the sport three years ago. Previous articleColumn: How did Donald Trump get elected president?